I cannot believe this is the last movie in the Hunger Games series. It's sad to think that Jennifer Lawrence's incredible performance of Katniss Everdeen has come to an end, as well as those of Josh Hutcherson, Liam Hemsworth, Woody Harrelson, Donald Sutherland, Willow Shields, Sam Claflin, Elizabeth Banks and many more. The Hunger Games is a series to own and watch again and again. Mockingjay picks up without intro right where Part 1 ended — you are sucked right back in the world of Panem. We left off with Peeta going crazy and trying to kill Katniss by choking her out. At that point, Katniss is being examined by a doctor to make sure the symbol of the rebellion is still good to lead. Mockingjay follows the book really closely. Because the last half of the book was so dark I pondered if the movie would be the same with a PG 13 rating. This movie is dark in a few scenes and am surprised they were shot to do so. Some scenes are not just gut wrenching but really emotional. Mockingjay shows what war can bring and at what costs and sacrifices. The war on the capital in this movie is shown to be real and to me this is my close second favorite in the series. Unlike the first part of Mockingjay where it was a build up and not much going on, this is the climax we have all been waiting for. Action junkies like myself will love this movie and will be surprised at what the game makers do to keep the rebels at bay with each trap they set. They set up a minefield of traps and if you don't have a special tool to locate them, each turn you take will be lead to certain death. There is so much death in this movie and if you are in love with certain characters, they just might perish and leave you with brief sadness. I can say I forgot a certain person dies in the book and seeing it happen made me think to myself "NO!! Why??" So be warned. 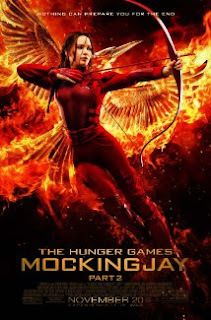 Mockingjay Part 2 is one not to miss and one that makes the ending a little more soothing than the ending of the book, which I know we all didn't like. The movie closes it nicely and makes it a lot easier to say goodbye. The only negative things I can mention about this film is that one scene from the whole movie was briefly cheesy, as in a couple seconds, and the other thing is seeing characters you know meet their doom on screen is really sad. Will Katniss end up with Gale or Peeta and have kids of her own? Book readers don't spoil the answers and those that don't know go find out.